Spinal motion restriction is used to reduce manipulation of the spinal column and protect, as much as possible, the spinal cord from further insult after a potential spinal injury. The term has been around since the 1980's, but has evolved to mean something very different than its original definition. In modern prehospital care, the idea of spinal motion restriction is to keep the spine in a neutral position relative to the patient's baseline. Maintaining the patient's baseline is extremely important in spinal motion restriction. Every patient is different, and any attempt to move a patient's spine to what is considered the "typical" anatomical position runs the risk of putting pressure on areas of the patient's spine that are not injured or to move an injured spine too far out of its normal alignment. To truly understand the tenets of spinal motion restriction and what we are trying to accomplish, it's helpful to know the history and evolution of prehospital spinal injury treatments. In the beginning, there was spinal immobilization. That was the standard expectation of any prehospital caregiver in emergency medical services (EMS) to treat suspected spinal injury. In most early textbooks and industry journals, the specific injury was nearly always referred to as cervical spine injury and the actual procedure was often called cervical spine (or c-spine) immobilization. Suspected spinal injury started as a presentation-based assessment. That means that patients' spines were not immobilized simply as a response to their mechanisms of injury. Instead, spinal immobilization was applied to patients with neck pain after a significant injury (long fall or motor vehicle collision, for example), evidence of paralysis, or unconsciousness. Early first responders had a wide range of mechanisms they considered significant enough to warrant spinal immobilization. In many parts of the country, ground-level falls were not considered enough of a reason to immobilize a patient's spine, often even in the presence of neck pain and clear evidence that the patient struck her head. In the last half of the 1980s, anecdotes of patients with what later became known as "occult" cervical spine fractures drove emergency physicians to routinely x-ray patients following nearly any mechanism of injury with the potential for blunt trauma to the head or a whiplash effect (whipping the head back and forth, putting pressure on the neck). Patients would present to the emergency department complaining of neck pain after being discharged from an earlier visit. Most of these patients had been treated for what, at the time, were considered minor mechanisms of injury with minor complaints. Some of these patients were found to have cervical spine fractures on x-ray after they had returned to the ER. As more patients' necks were filmed in the x-ray department, more fractures were found. Assumptions were made that it was easier to fracture the vertebrae than originally thought possible. Driven in some cases by fear of malpractice litigation, emergency docs increased the frequency of cervical spine x-rays until they were ubiquitous in everything from ground-level falls to gunshot wounds. Prehospital training broadened to specify that any possible mechanism that could place pressure on the neck indicated the need for spinal immobilization. EMT's and paramedics were taught to assume spinal injury on any patient who fell and to assume falls as a mechanism of injury for any patient who initially presented as unconscious. The term spinal immobilization gave way to spinal precautions as the treatment became as common as oxygen. Spinal immobilization was considered to have equal footing with airway control and bleeding control in the traumatic patient. All of those x-rays were expensive and potentially exposed patients to unnecessary radiation. Two independent groups of doctors developed assessment tools to help emergency physicians identify the patients who really needed to have their necks x-rayed. The NEXUS rule and the Canadian C-Spine rule were somewhat hesitantly implemented in emergency departments around the US and Canada. Paramedics grew suspicious of the ER docs ripping off their cervical collars and twisting the patients' heads from side to side. Once the practice gained widespread use, paramedics began to question why the patient should be placed in spinal precautions in the field simply to have emergency physicians remove the equipment in the ER hallway. Soon, studies were conducted to evaluate the use of the tools as predictors for which patients need to be immobilized in the first place. Paramedics were tested to see if we could identify patients as well as the ER docs. 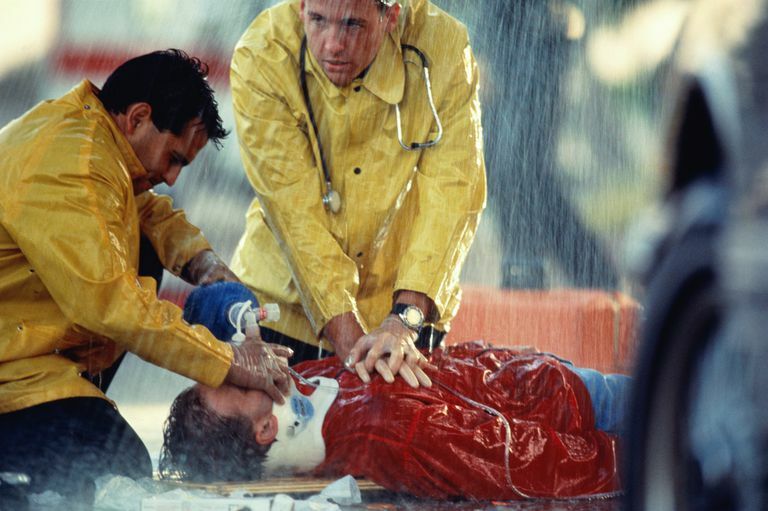 Midway through the first decade of this century, EMS systems around the US were as likely as not to "clear" cervical spines in the prehospital setting. As the light shone brighter on the practice of spinal immobilization or spinal precautions, some prehospital providers and physicians began to question the practice completely. The use of hard backboards was particularly bad, leading to pressure sores and pain in patients who had to lie on the boards in ER hallways for hours. Cervical spine collars (also known as extrication collars or c-collars) are intended to secure the cervical spine and restrict movement of the head after a potential spinal injury. They are often misapplied or sized incorrectly and there is some evidence suggesting that they could increase intracranial pressure in patients with closed head injuries. Lying on a hard backboard with the head secured to the device, even when the torso is also securely fastened, still provides significant movement during transport to the hospital. Simple physics holds that the weight distribution and shape of the patient's body is going to allow her torso to shift much more than her head, putting force on the cervical spine laterally as well as compressing and distending the vertebrae. The lack of randomized, controlled trials for the use of hard backboards and cervical spine collars has led some EMS systems to significantly reduce the use of these two modalities. San Joaquin County, California was the first EMS system in the country to refuse to allow EMT's and paramedics to use or carry backboards on ambulances at all. As hard backboards find new lives as surfboards and snow toboggans, spinal immobilization has followed a similar path, moving from being rigid and structured to something more loosely defined and harder to quantify. Indeed, many paramedics are finding it difficult to accurately document the procedures used to "restrict" motion, which could include something as simple as reminding a patient not to move his head. Best practices include the use of assessment techniques similar to those of the NEXUS or Canadian C-Spine Rule. The patient is questioned to determine latent pain. If the patient has no pain or pain that appears to be lateral to the midline so as to indicate that it is not in the direct vicinity of the spinal column, the paramedic palpates the spinal column. If no tenderness or deformity is found, the paramedic will guide the patient through a series of flexion and extension, rotation, and lateral movement of the neck. If, during this movement, the patient does not complain of new or increased midline pain, spinal motion restriction will most likely be omitted. Adequate and accurate assessment relies on the patient's ability to communicate with the caregiver. If the patient is under the influence of alcohol or drugs, the paramedic must maintain and high degree of suspicion for spinal injury. Even in that instance, however, the paramedic might not choose to use a backboard and rigid c-collar for spinal care. A tenet of spinal motion restriction rather than spinal immobilization is the ability for the patient to restrict her own cervical spine movement. Instead of lying supine and strapped securely to a backboard, patients are often left sitting up on the gurney and a soft collar is placed more for a reminder not to move than for any significant restriction of motion. Patients who are not able to follow commands and who have a high suspicion for unstable spinal fractures would benefit from a device known as a vacuum splint. Vacuum splints conform to the contours of the patient's body and can immobilize more effectively without the negative impacts of backboards. The use of spinal motion restriction rather than spinal immobilization is a step in the right direction for spinal injury care. Karason, S., Reynisson, K., Sigvaldason, K., & Sigurdsson, G. (2014). Evaluation of clinical efficacy and safety of cervical trauma collars: differences in immobilization, effect on jugular venous pressure and patient comfort. Scandinavian Journal Of Trauma, Resuscitation And Emergency Medicine, 22(1), 37. Michaleff, Z., Maher, C., Verhagen, A., Rebbeck, T., & Lin, C. (2012). Accuracy of the Canadian C-spine rule and NEXUS to screen for clinically important cervical spine injury in patients following blunt trauma: a systematic review. Canadian Medical Association Journal, 184(16), E867-E876. Morrissey JF, Kusel ER, Sporer KA. Spinal motion restriction: an educational and implementation program to redefine prehospital spinal assessment and care. Prehosp Emerg Care. 2014 Jul-Sep;18(3):429-32. Epub 2014 Feb 18. Vaillancourt C, Stiell IG, Beaudoin T, Maloney J, Anton AR, Bradford P, Cain E, Travers A, Stempien M, Lees M, Munkley D, Battram E, Banek J, Wells GA. The out-of-hospital validation of the Canadian C-Spine Rule by paramedics. Ann Emerg Med. 2009 Nov;54(5):663-671.e1. Epub 2009 Apr 24. Erratum in: Ann Emerg Med. 2010 Jan;55(1):22.